Servers | KGS | Specially for MilanMilan! sensation! To change the tradition, I decided to post the game he won. 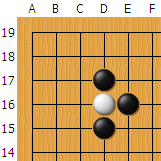 Another reason: itвЂ™s a short game and a good example of losing the game, because of greedy moves.